The project was in 20017 once again in the limelight, this time triggered by seemingly conflicting statements made by Minister for Electricity M.M. Mani in the State Assembly. Chief Minister Pinarayi Vijayan added to the debate stating that the State needs development and the government would go ahead brushing aside the arguments of ‘anti-developmentalists’. He seemed to say that, given the opportunity, his government would rather go ahead without fear of angering green activists who campaigned against the project based on figures that show that the water level in the Chalakudy river does not justify a dam to generate power.(2). The green activists’ answer to what they see as clandestine moves from the power-at-any-cost lobby is simple. 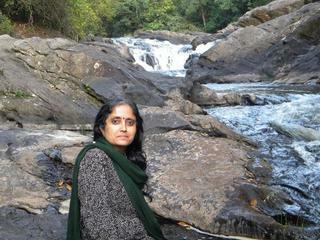 A. Latha, a women leader who died of cancer soon after, said on behalf of the of the Chalakudy Puzha Samrakshana Samiti, a group that has been campaigning against the power project: “All that we want the State government to do is to honour the promise in the Left Democratic Front manifesto to take steps to protect rivers and improve their water flow. The Haritha Keralam Mission, as envisioned in the LDF's manifesto, is all about reviving rivers and not constructing dams”. Occupying the other side of the divide and charged with the responsibility of executing the project, KSEB Ltd. (formerly Kerala State Electricity Board) is groping in the dark with no clear directives from the government even as a debate rages in the State over the proposal. Although it might be true that the government has not made any substantive move to launch the project work, a large number of green activists and a spectrum of political parties, especially the CPI, the second largest constituent of the ruling alliance, the Congress and the Kerala Sasthra Sahitya Parishad (KSSP), have used the occasion to reiterate their strong opposition to the project. Social media is abuzz with campaigns in favour of and against the project. Some have also highlighted the recommendations of the Madhav Gadgil-led Western Ghats Ecology Expert Panel (WGEEP) to drive home their arguments against the project. 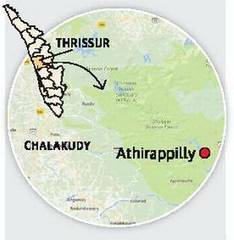 ‘Oorukoottam’, the tribal panchayat of the Athirappilly area, had earlier passed a resolution against the project and has once again resolved to oppose it. A writ petition was pending against the project in the Kerala High Court and it may not be an easy task to overcome these challenges in the limited time to take the project forward. In 1994, The Kerala State Electricity Board (KSEB) had proposed the Athirappilly Power Project, a 163 megawatt hydroelectric project, on the 144 km small but heavily dammed Chalakudy River. This included a 23-metre high and 311-metre wide dam around 5 kms upstream of the picturesque falls in the Vazhachal Forest division in Thrissur. If this project is constructed, it will submerge an area of 138.8 hectares. Water from this reservoir will be diverted 7 km downstream through a 4.5 km long tunnel to a power house, located on the banks of a tributary of the main Chalakudy River. The fear is that the falls may possibly dry up if the project becomes a reality. KSEB suggests that it would adjust the water releases to maintain the waterfall but environmentalists doubt that. Another worry is that the project could displace “Kadars”, a tribal group of the area. They dwell in the forests near the Chalakudy River and their numbers are as low as 1500 today given the forced displacement they have been subject to in the last nearly 150 years owing to forest clearances. 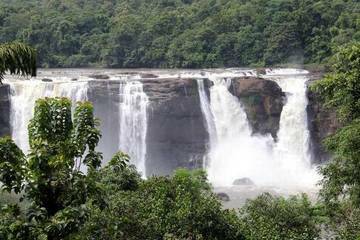 The case of Athirapally is intricately woven to the larger context of the Western Ghats. The Western Ghats stretches along the western edge of the Indian peninsula sandwiched between the Deccan Plateau and the coastal plain along the Arabian Sea. Western Ghats spans across six states along the western coast of India - Maharashtra, Goa, Gujarat, Karnataka, Kerala and Tamil Nadu. Prof. Madhav Gadgil, renowned ecologist known for his studies on people-environment relationships, has fostered his love of ecological field work by extensive work in the Western Ghats. At a lecture on 'Science, democracy & ecology in contemporary India' in New Delhi, Gadgil talked about the Athirapilly project. Gadgil, as Chairman of the Western Ghats Ecology Expert Panel (WGEEP), had come up with a report in September 2011, which triggered a public debate on environment-development choices. Gadgil’s report had demarcated areas to be notified as 'ecologically sensitive' and had put key curbs on the mining industry. Listed by the United Nations Educational, Scientific and Cultural Organisation (UNESCO) as one of the top eight bio-diversity hotspots in the world, the Western Ghats area was in need of nuanced regulation of activities, Gadgil said. While specifically studying the Athirappilly hydroelectric project, the Gadgil Panel found that “the Environmental Impact Assessment Report (EIA) prepared for the project and the public hearings conducted were flawed and the High Court had repeatedly set them aside. The people too are opposed to the project and nearly all 1200 present at the second public hearing on the proposed dam had spoken against it. Nearly, 90% of the written representations after the public hearing too were opposed to the project. Gadgil sees hope in grassroots research and advocacy groups like the River Research Centre (RRC), which conducted an independent assessment of the proposed project. RRC’s assessment points to a number of flaws as per Gadgil. According to the Chalakudy River Protection Forum set up by RRC, there is not enough water to generate the power as claimed. Power generation would also adversely impact the current irrigation capacity of the river. It could also affect the scenic waterfall itself and thereby the thriving tourism industry, which draws 8-10 lakh tourists a year. It is clear that development can't happen at any cost yet the answer to the environment-development dichotomy isn't clear. Gadgil says that it lies in “implementing the many well thought provisions of various Acts and Schemes for protecting the environment, and for devolution of democratic powers”. Why? Explain briefly. The dam is not yet to be built, final decision has been announced several times. In 2018 it i still an open question, probably the dam will not be built. (2) Reported in The Hindu, 4 March 2017 by K S Sudhi. Other Comments "If Chalakudy river basin and Athirapally waterfall still remain more or less intact, it is no doubt due to the decade-long green battle of Dr Latha Anantha. Former environment minister Jairam Ramesh who cancelled the eco-clearance of the hydel project said it was Latha's research papers which made him understand the significance of the region. Latha left us after battling cancer for almost a year and a half. If Sugathakumari pioneered the Silent Valley agitation into the popular imagination in the '60s, Latha's work is contemporary and very relevant ..." (Times of India, 26 Nov 2017, Anjana Georgei).